Jessica Compton’s family of four would have no cash income unless she donated plasma twice a week at her local donation center in Tennessee. Modonna Harris and her teenage daughter Brianna in Chicago often have no food but spoiled milk on weekends. "With any luck (calling Bernie Sanders) this important book will spark election year debate over how America cares for its most vulnerable." 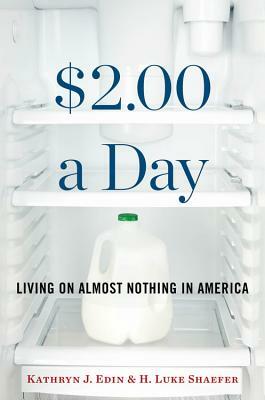 "In $2.00 A Day, Kathy Edin and Luke Shaefer reveal a shameful truth about our prosperous nation: many—far too many—get by on what many of us spend on coffee each day. It's a chilling book, and should be essential reading for all of us."